Denial, anger, bargaining, depression, acceptance. 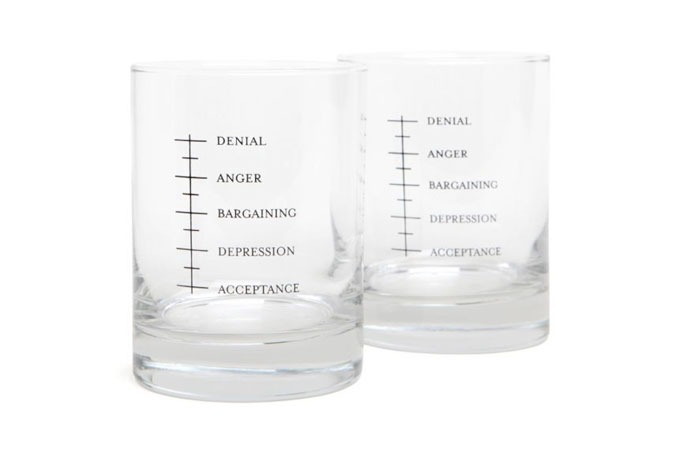 Grief is a 5-step process, according to psychiatry pioneer Elisabeth Kübler-Ross’s landmark 1969 model; first you pretend it’s not happening, then you throw a fit, then you try to buy your way out of the situation and burst into tears before reaching sweet resignation. Jack Spade, arbiter of stylish men’s handbags, provides you the proper tools: the brand new Good Grief glasses.